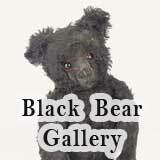 Does anyone know anything about this bear? To be honest I really have No idea as to the bears back story. I found him in an old box of my fathers, and aunts toys from when they were children. I assume he is an old pooh bear because of his colouring and the fact that most of my father's bear were winnie the pooh. One thing I noticed was that the thread he was sewn with is more like fishing line than thread. It's plastic as opposed to cotton. Yes he does have the look of a teddy from the 60's era. Similar to Wendy Barton bears I would say. Perhaps made by the Joy company. Does nay one else have any ideas? Comments for Vintage Pooh Bear? I have been looking for my bear (Beary) for a while now and this bear comes closest to him. I got mine when I was about 2 years old, 1972, from Ann and Hope store in Cumberland, RI. He was the same yellow color with a soft, plush material (more like a plush blanket rather than a fuzzy stuffed animal). He had black plastic eyes and plastic beads inside - I know this because he got a hole in him so the beads leaked out some. I lost him years ago and was hoping to find his twin somewhere. I have no idea if he had a tag or what it may have said. 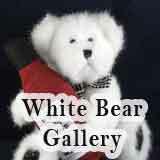 If it is the same bear I would be interested in finding out more information such as where the bear is originally from. 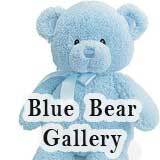 Or if anyone with this bear may have gotten it from the same store as me. Thank you. I agree with the others. 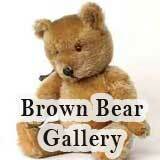 I do believe this is a vintage Pooh Bear. Probably early 70's or even earlier. bean bag I got in Biloxi MS in 1969- I got a bunch of these animal bean bags - first time I have ever seen it online!!! Yes that is a winnie the pooh. I have him. I think i remember him having on a red bib that said"pooh" or "Winnie the pooh". And back in the 1970,s Sears was about the only store that sold them. Hi, I still have my Winnie the Pooh Bear and he looks just like the one you found. I was born in 1971. He's the only item i have left from my childhood. I have one of these. Had it since I was very little. Born in 1971. I used to call him Fritz, don't know why. Pretty sure this is a Pooh Bear. Possibly came from J.C. Penney. Animal Fair and Princess Soft Toys DID make some Pooh plush. The only one I can recall I believe is a Hand Puppet however if you google Animal Fair plush toys you will see those black smooth button eyes are very common in many of their plush. 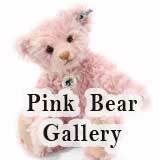 It is an idea where you might find similar bears and plush. 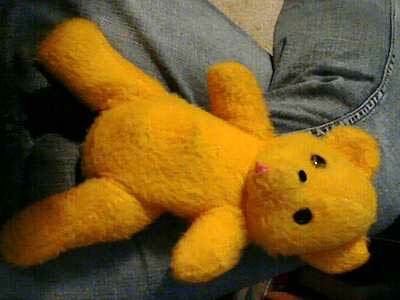 This looks exactly like the Pooh Bear my son received when he was born in 1974, including the "thread" you describe. His had a music box in it that could be wound up and it played the Winnie the Pooh song. 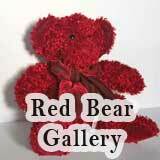 The bear originally had a little red jacket. It was a stiff fabric with the outer side finished with something like flocking. Kind of felt like, but not exactly. Our jacket is long gone also, but my grandson now has the Pooh Bear. My son's bear was about 10" or so tall but his legs remained in seated position.